With more and more people learning how to use various photo editing programs every day, fake photos are becoming increasingly common. And without people checking their sources, those photos quickly go viral. Bored Panda has compiled a list of fake viral photos that fooled internet users everywhere. From marijuana in space to bears chasing cyclists, some edits are so well made, you’ll have a hard time believing it’s fake even with the real picture right next to it. 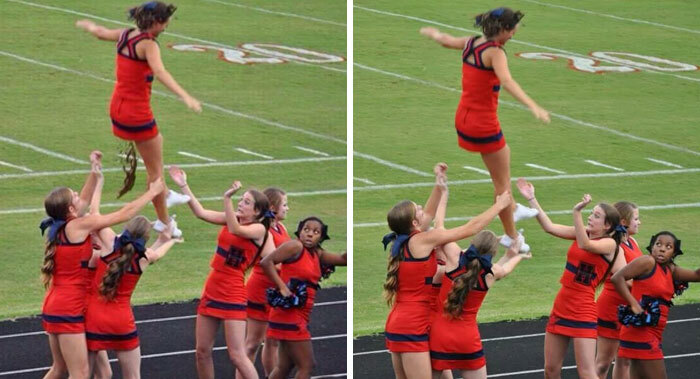 Check out the fake viral photos in the gallery below! This photo of a lion strapped to a bed to film the MGM intro turns out to be fake – the lion is actually undergoing a CAT scan. The picture of a man next to a giant rice wave has recently gone viral and even sparked some funny memes. 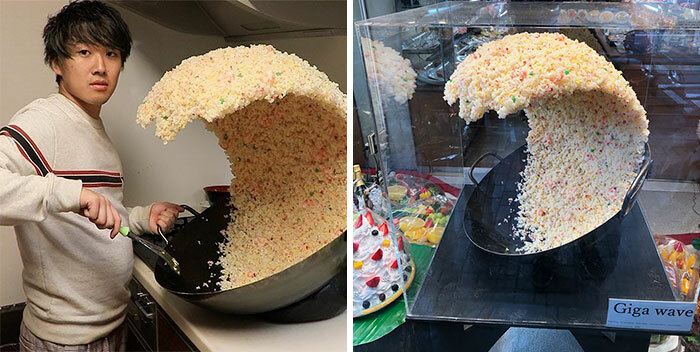 It later turned out that it was fake and the rice wave was just a sculpture found in a fake food shop in Tokyo. 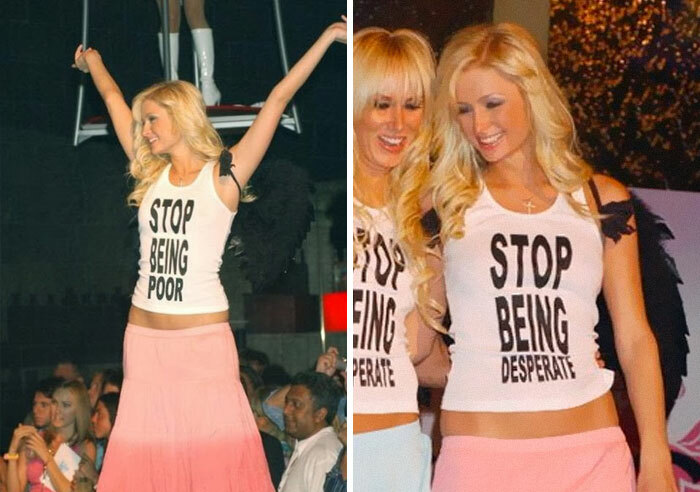 This one’s a true classic, that has been circulating the internet for many years. Yet, like all of the things in this list, it is nothing more than a clever edit. 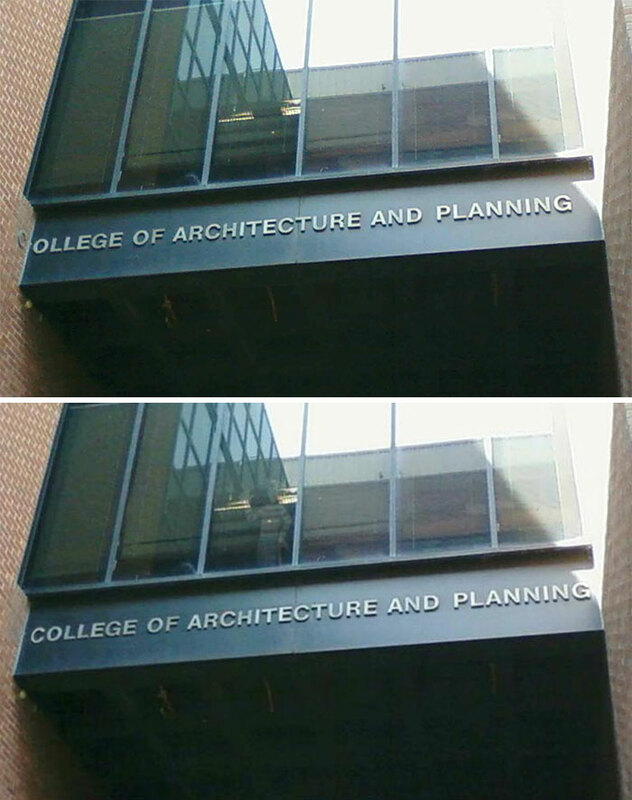 While the photo on the left is clearly photoshopped, seeing the original doesn’t really make it that better. 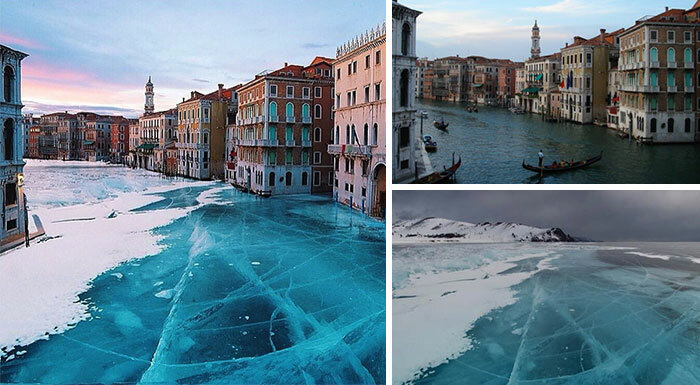 This viral ‘Frozen Venice’ picture is actually a composite of two pictures: Venice and Lake Baikal frozen during the wintertime. 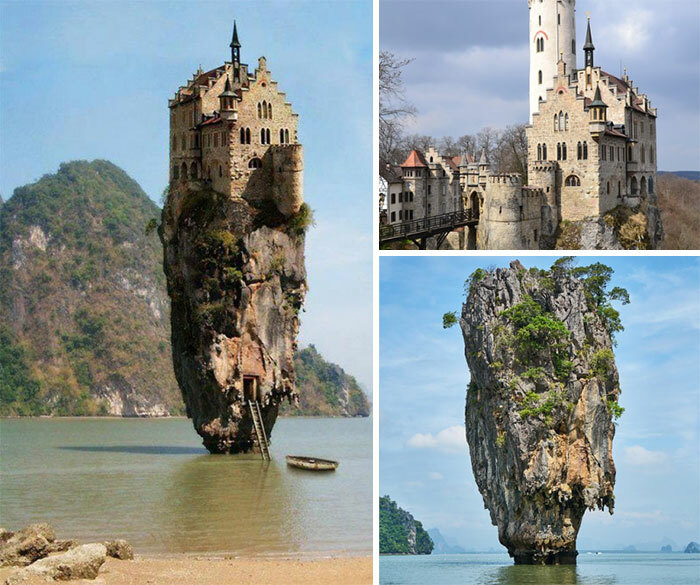 This castle on top of a rock looks like something out of a fairy tale but the picture is actually a castle in Germany and a rock in Thailand blended together. As cool as it may look, this viral pilot selfie was safely taken when the plane was parked. Lenticular clouds are already pretty cool by themselves – we guess the author thought that adding more would make them even cooler? While a black lion would look totally badass, we sadly have to say that it’s only the result of some clever editing. The #10yearchallenge hashtag recently went viral and with it did this fake photo. 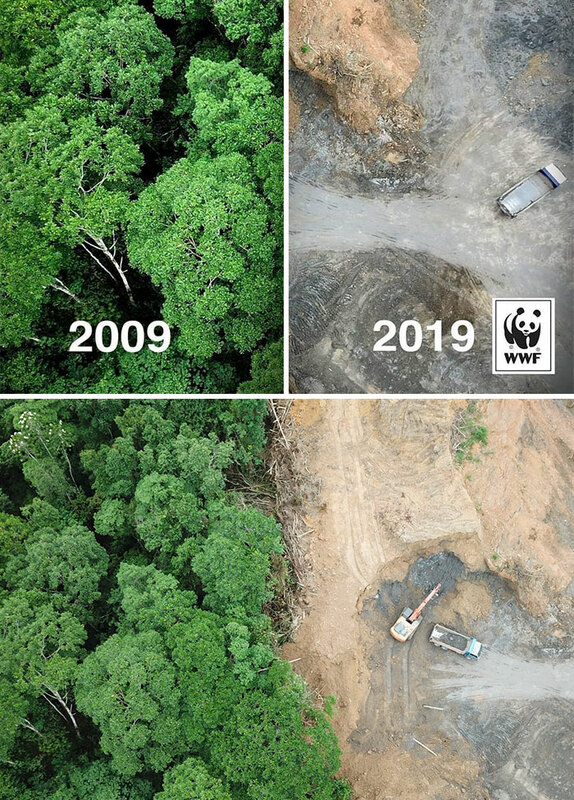 Although deforestation is still an important problem, this picture was actually created from the same photo. 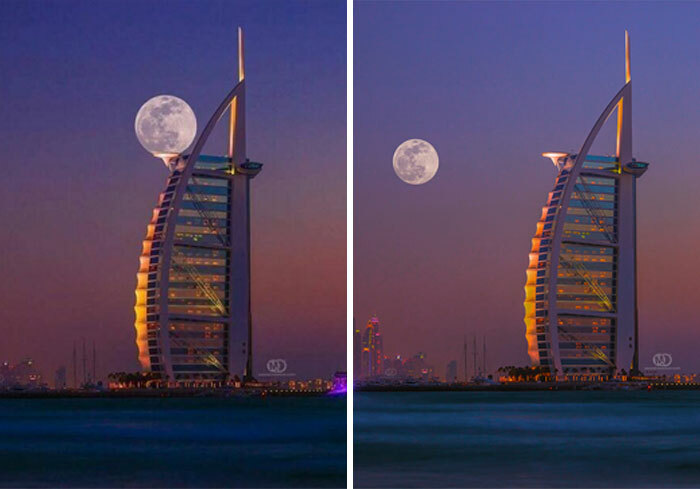 To make this photo taken by Mo Aoun more interesting, someone decided to move the moon. 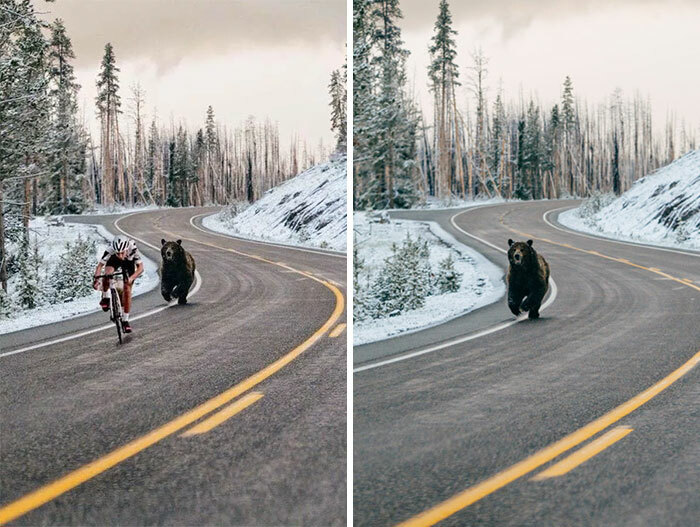 While being chased by a bear might be great motivation to cycle faster, the photo did not originally feature the cyclist. 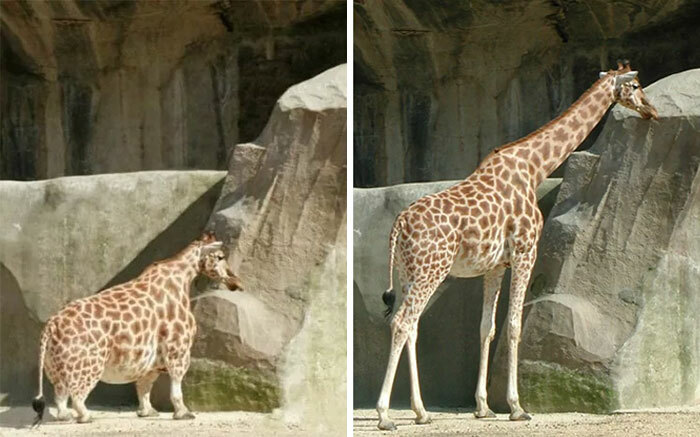 Sadly, this picture of a small chubby giraffe proved to be fake too. 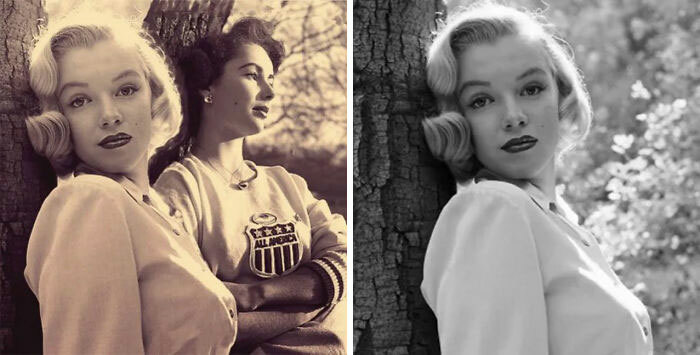 It might look like an iconic photo of two legendary celebrities together but, unfortunately, Elizabeth Taylor was added in Photoshop. 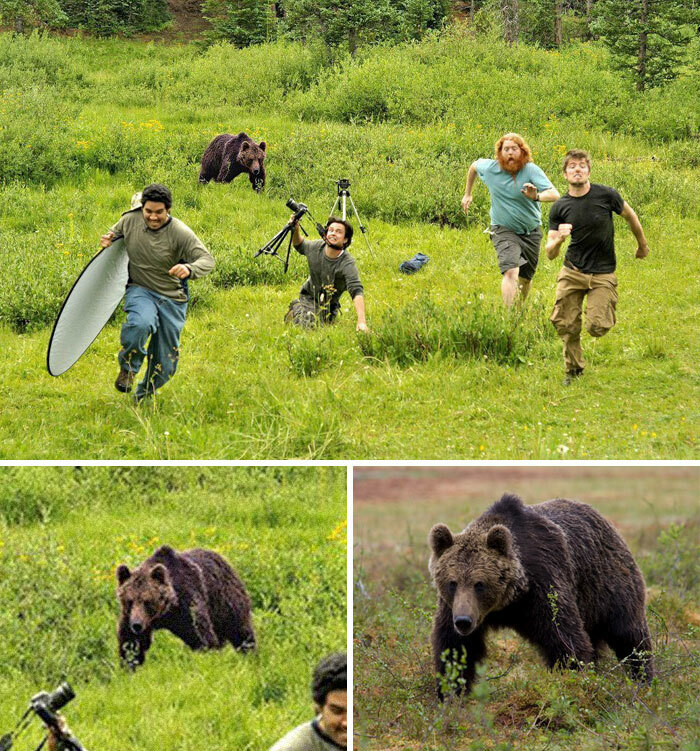 This photo of a group of National Geographic photographers being chased by a wild bear is photoshopped too. And if you think the bear looks kind of familiar, that’s because it’s a rather popular stock photo. Thankfully, this dabbing soldier did not actually go to war – the photo is actually a behind-the-scenes picture from the movie Dunkirk, shot in 2017. This island might look like the flag of Turkey, but sadly the star in the middle is fake. 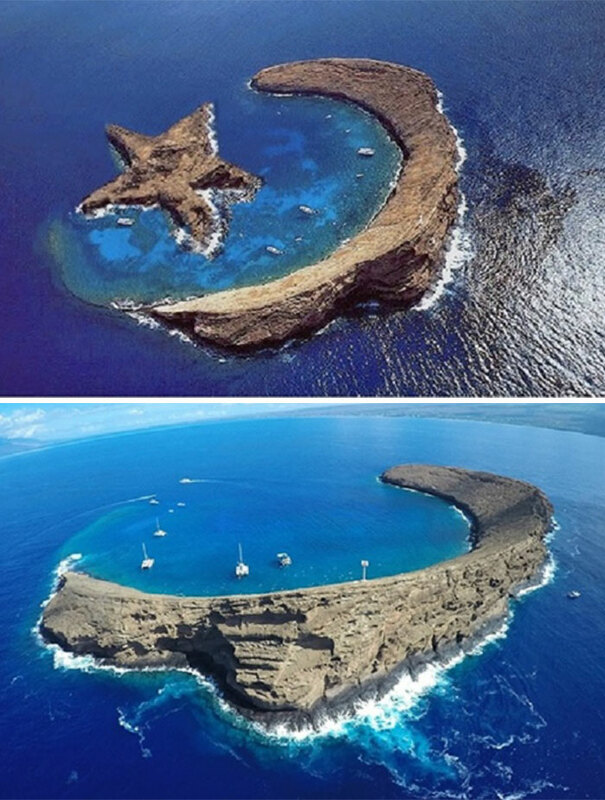 It is actually the Molokini island, located between the islands of Maui and Kahoolawein Hawaii. 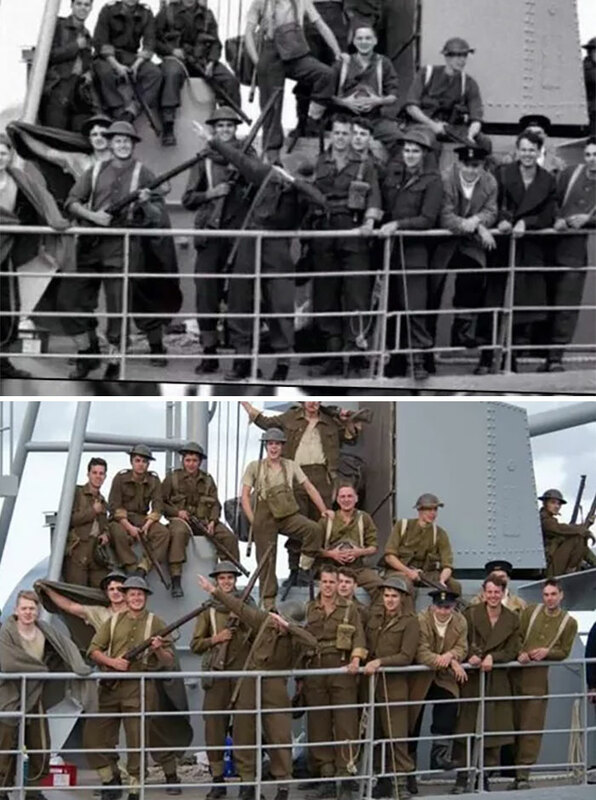 Even though the original does not make it that much better, the photo on the left is fake. 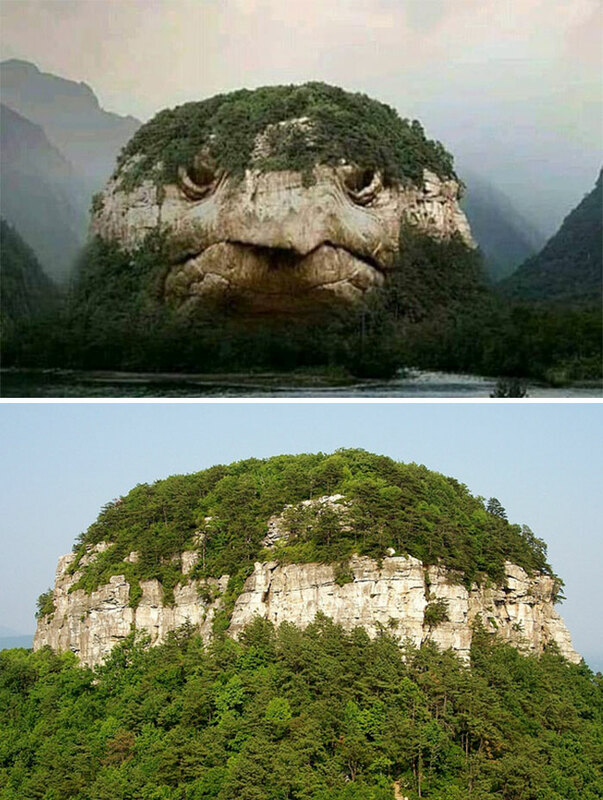 As cool as it may look, the ‘Turtle Mountain’ is fake – it’s actually Pilot Mountain located in North Carolina and we think it looks pretty cool on its own. 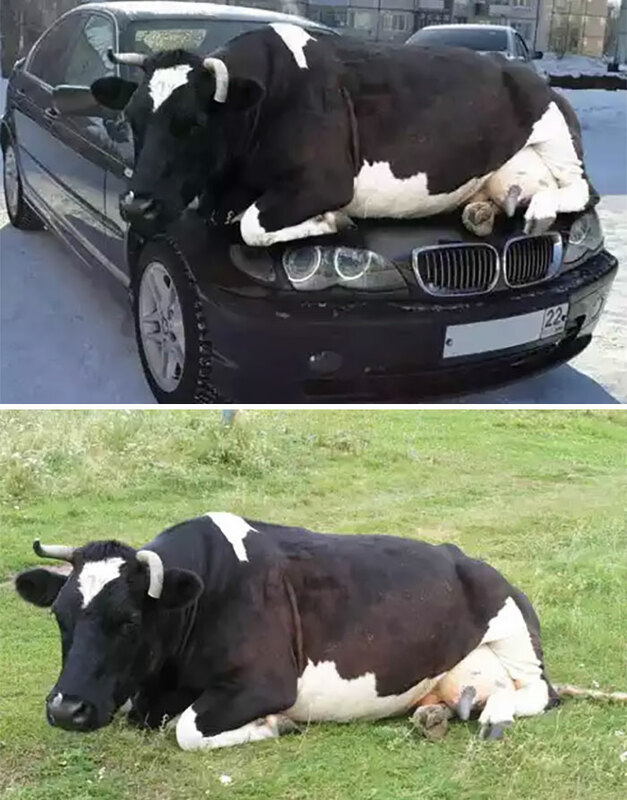 No cows were harmed in the making of this fake viral picture. This satellite photo of India during the Hindu festival turns out to be a composite of many different satellite images. 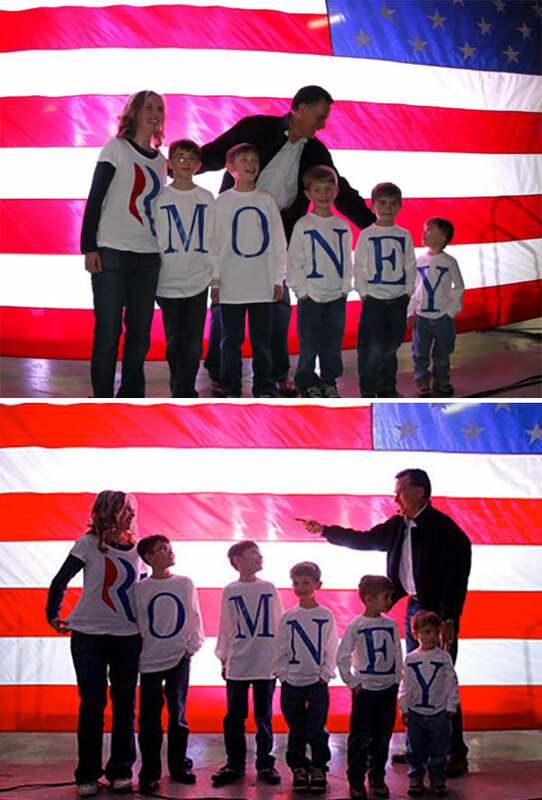 As hilarious as this misspelling of the Romney last name may look, the photo is actually edited. 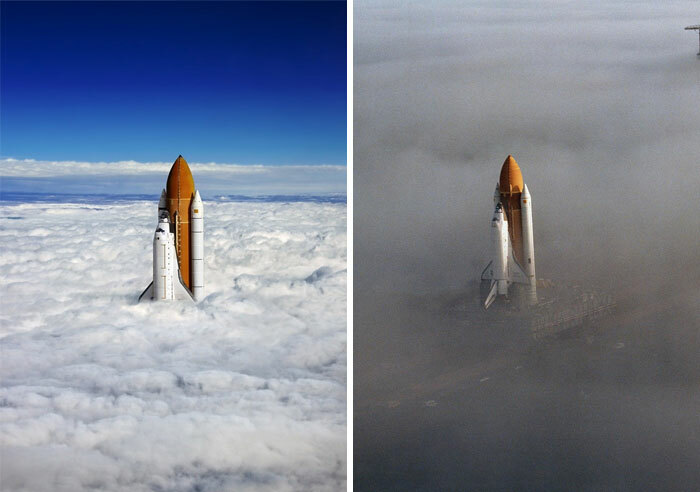 This photo of a space shuttle rising out of the clouds is photoshopped – but you have to agree that even the original looks pretty cool. 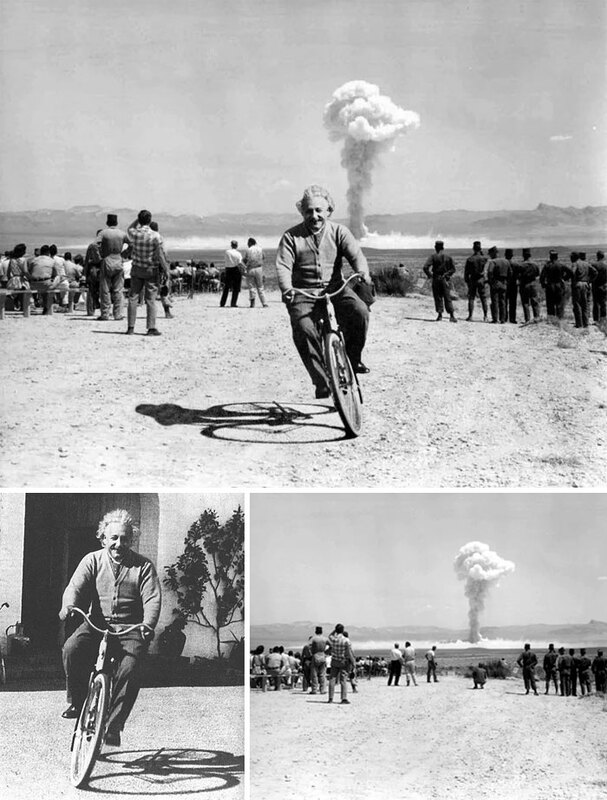 Another fake photo debunked – Albert Einstein was not happily riding his bicycle in front of a mushroom cloud. Although many mysteries and conspiracy theories circle the 9/11 attack, this viral photo was outed as fake. 10 Best exciting Tuned Cars by Carlsson Company! !